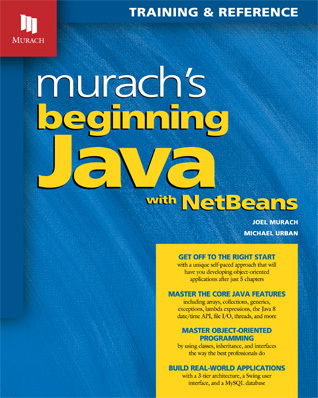 We’ve designed Murach’s Beginning Java with NetBeans specifically for beginning programmers and programmers with limited experience who want to learn Java at a professional level. By the time you finish this book, you’ll have all the core Java skills that you need to move on to web or Android programming. Section 1 presents a 6-chapter Java course that gets you off to a great start. This section works for complete beginners as well as experienced programmers because it lets you set your own pace. If you’re a beginner, you’ll move slowly and do all the exercises. If you have some experience, you’ll move more quickly and do the exercises that you choose. From the start, you’ll be using the NetBeans IDE because that will help you learn faster. Then, by chapter 3, you’ll be developing applications that use classes from the Java API. By chapter 4, you’ll be developing object-oriented applications that use your own classes. By chapter 5, you’ll be using a 3-tier architecture to structure your object-oriented applications like a professional. And by chapter 6, you’ll be using the best practices for testing and debugging your applications. In section 2, you’ll expand upon what you learned in section 1 by mastering more of the core Java skills that you’ll use all the time. That means you’ll learn new skills, like how to work with strings and arrays. But you’ll also learn more about topics that were introduced in section 1, like working with primitive types and operators and coding control statements. These are the essentials that you need for section 3. This book has you creating simple object-oriented programs right from the start in section 1. Then, section 3 cuts through the mystery of inheritance, interfaces, polymorphism, and the factory pattern so you can learn how to create and use sophisticated business and data access classes. When you finish this section, you’ll know how to develop real-world, object-oriented, business applications. Like section 2, section 4 lets you expand your core Java skills in new ways. To be specific, it teaches you how to work with collections, generics, lambdas, dates, times, exceptions, file I/O and threads. Because each chapter in this section is independent of the others, you can add these skills to your resume whenever you need them. When you complete sections 1-4, you’ll have all the Java skills you need to start learning web and Android programming. But there’s more! The 4 chapters in section 5 introduce you to the skills that a professional Java programmer uses to develop desktop applications. To start, these chapters show you how to create a MySQL database for an application and how to write the Java code that works with the data in this database. Then, these chapters show how to develop a graphical user interface (GUI) for the application. These chapters are designed to give you a better appreciation for what real-world Java programming is like, whether that be desktop, web, or Android programming. That, in turn, will help you decide what to learn next to build your Java career. For the past 13 years, we’ve often had true beginners tell us that they like our Java book overall, but they also find it overwhelming at times. (As one reviewer of the first edition put it, “It’s not for the faint of heart!”) They’ve requested more explanation of certain topics, more examples, and a more relaxed pace. So that’s what Murach’s Beginning Java delivers. We took a hard look at the way we present material in Murach’s Java Programming and rearranged topics with beginners in mind. We introduced object-oriented programming earlier so that the OOP mindset would become natural right at the start. We added more explanation on core programming concepts, like working with classes, numbers, strings, and control structures. We slowed the pace some, breaking the material down into shorter chapters that would be easier to master. We added more examples to guide beginners through the code and more exercises to let them practice what they’ve learned. In short, we now have the ideal book for you if you’re new to programming and Java. Unlike many Java books, this book shows you how to use an IDE for developing Java applications. That’s how Java programming is done in the real world because an IDE is loaded with time-saving development tools. So that by itself will help you learn faster. For this book, we’ve chosen the NetBeans IDE because it’s free, widely used, and easy for beginners to set up and use. So chapter 1 shows you how to get started with this IDE, and subsequent chapters present new NetBeans skills whenever they’re useful. Unlike many Java books, this one gets you going with object-oriented programming (OOP) from the start. By chapter 3, you’ll be developing applications that use the classes from the Java API. By chapter 4, you’ll be doing object-oriented programming with your own classes. And by chapter 5, you’ll be using a 3-tier architecture to structure your object-oriented applications like a professional. That means that you’ll be using and thinking objects from the start...the way Java was designed to be used. Unlike many Java books, this one focuses on the Java features that you will use every day on the job. As a result, it doesn’t waste your time by presenting Java features that you probably won’t ever need. This also means that all of the examples in this book are drawn from real-world applications. This is especially apparent in the object-oriented chapters, where most competing books resort to unrealistic examples that are difficult to apply on the job. One of the goals of this book is to present all of the core Java skills that you need to start learning Java web programming and Android programming. That’s why we made sure that this book covers all the prerequisites you need for Murach’s Java Servlets and JSP (our Java web programming book) and Murach’s Android Programming. But regardless of what Java book or course you go on to, we haven’t seen another beginning Java book that prepares you so thoroughly. This book is perfect for developers who are moving into programming Android apps or Java web applications. The first four sections deliver the core Java skills that you need, whether you’re looking for a refresher or a first course in Java. As you can tell from its title, this book shows you how to use the NetBeans IDE to code, test, and debug applications. It’s a great tool for beginners that’s easy to use, free, popular, and that runs on all operating systems. You can download Java and its documentation for free from the Oracle website. Likewise, you can download NetBeans for free from the NetBeans website. To make this easier for you, Appendix A (for Windows) and Appendix B (for the Mac) explain the procedures you will use to download and install both pieces of software. If you already have experience with Eclipse or want to use it instead, please note that we have an Eclipse version of this book called Murach’s Beginning Java with Eclipse. The only difference between that book and this one is the IDE. Since web programming is one of the primary uses of Java, we also offer a book on web programming called Murach’s Java Servlets and JSP (3rd Edition). It shows you how to use Java servlets and JavaServer Pages as you develop professional web applications. As you read that book, you’ll discover that Java web programming requires most of the skills that are presented in sections 1-4 of Murach’s Beginning Java with NetBeans. Another primary use of Java today is developing Android apps for tablets and smart phones. So we also offer a great first book on that subject, Murach’s Android Programming (2nd Edition). Like our Servlets and JSP book, this book assumes that you have the skills that are presented in sections 1-4 of Murach’s Beginning Java with NetBeans. Another Murach book that you should be aware of is Murach’s Java Programming. This book has been one of the best-selling Java books since its first edition in 2001, but it isn’t a beginning book. As a result, it is organized differently, moves faster, goes into greater depth, and presents some additional subjects, particularly on GUI programming and handling data. In general, though, you shouldn’t need this book if you have Murach’s Beginning Java. “Great book for working with Java and NetBeans. In addition to Java basics, it presents essential Java skills against the core APIs in an easy-to-understand format. If you’re a beginner and want to see whether this book is right for you, please download and read the first chapter. You can also download the book applications and exercises, so you can do the exercise at the end of chapter 1 and work with some sample code. This chapter gets you started by introducing Java programming and showing you how to use NetBeans to create, edit, compile, and run Java projects. All of the code is stored in NetBeans projects that are ready to be used with the NetBeans IDE. Appendix A in the book describes how to install these files on a Windows system, and Appendix B describes the installation process on a Mac. I'm inexperienced, thoroughly intimidated, and have bough 6 books on beginning Java, including this book and the other Murach Java book. I've spent a lot of hours and a small fortune. I can say that Murach's writing and presentation of the material is equal to the others. Its presentation of the material helps with the opposing page view approach to subjects. The ebook is disappointing, but I'm new to it. I'll give it another week. The Murach books will save me if anything does.. While I believe this one of the best Java books on the market, I was a little disappointed with Chapter 21 & 22 which had all the source code, but I was unable to modify the Swing forms because the palettes were empty. Did I miss something? I couldn't find any solution to explain this condition.